Simple and Sweet Sheer Shoulder Veil. This shoulder veil features our cascading sides cut, and is gathered onto a comb. This wedding veil can be worn at any position on the head. A small 1/8" satin ribbon edge gently brings out the soft cascades in the veil. 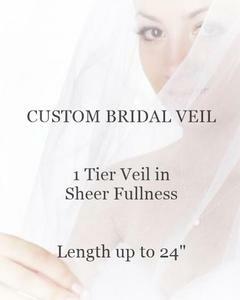 This shoulder length veil would be the perfect finishing touch for almost any bride!